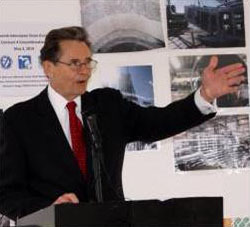 Anthony V. Marrocco, Macomb County Public Works Commissioner, discusses progress on the Oakland-Macomb Interceptor rehab project at a ground breaking ceremony for Contract 4 at a construction site near Ten Mile and the ITC Corridor in Warren. 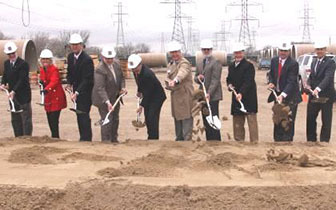 The $160 million project will restore the structural integrity of the giant transmission line that serves 850,000 residents in Macomb and Oakland counties. The Drain Board for the Oakland-Macomb Interceptor is shown inside a section of ten foot diameter sewer pipe waiting to be installed on Contract 4. The Drain Board members are, from left, Commissioner Marrocco; Mike Gregg, Deputy Director, Michigan Department of Agriculture and Rural Development, Chairman; and Jim Nash, Oakland County Water Resources Commissioner, Secretary. 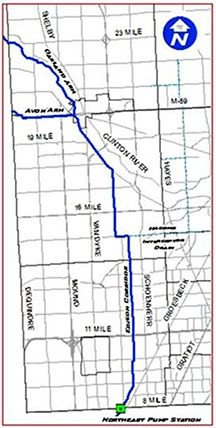 Shown in blue is the route of the massive Oakland-Macomb Interceptor. 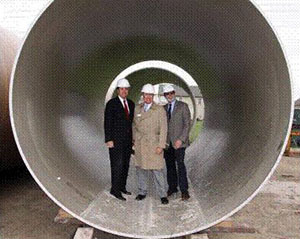 The 22 mile long pipe, in sizes ranging up to 12 foot diameter, was purchased from Detroit in 2009. It is the sole sewage transmission line for 850,000 customers in 25 municipalities in Macomb and Oakland counties. The Drainage District embarked on a $160 million rehab and repair project in 2010 to restore the interceptor’s structural integrity in order to prevent a sewer collapse and loss of service. Four contracts have been let to date, with two more scheduled to be bid out this fall to wrap up the program. Drain Board members, contractors and engineers team up for a group photo of the groundbreaking for Contract 4 of the OMI rehab program.  Contract 4 was awarded to Jay Dee Contractors, Inc., of Livonia in the amount of $46 million. Pictured from left are John Hiltz of OHM, Karen Ridgeway of Applied Science, Gordon Wilson of Anderson, Eckstein and Westrick, Keith Swaffer of NTH, Commissioner Marrocco, Board Chairman Gregg, Commissioner Nash, Tom Diponio of Jay Dee, Fritz Klingler of FEK Engineering and Steve Benedettini of Spalding Associates. The Public Works Office management team is shown at the construction site. 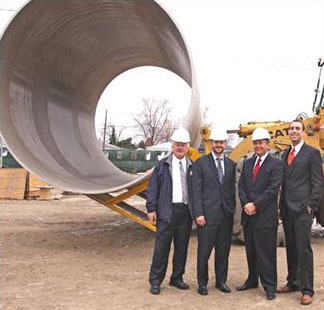 They are from left, William Misterovich, Chief Deputy, Jason Matteo, Chief Engineer-Wastewater, Commissioner Marrocco, and Richard Sulaka, Deputy Commissioner.